The camp is in an uproar. This morning, rumors from Chungking4 say the Jap people are circulating posters for the elimination of Jap premier Tojo. He’s the guy who always wanted to take on the United States. No fighter activity over Rabaul for the past three days. Hooray! There is still plenty of flak however. Seehorn and Russell are playing Pitch.5 Seehorn says he is going to have his girl come down over for the weekend. Can’t see how any of the forced down American airmen will starve in this area. These islands are lousy with different types of food. Everything from bananas to pineapples. Major General Twining relinquished command of the 13th AAF. recently. Takes a mighty good record with him. Evidently our new C.O. is General Harmon.6 Maybe that’s why the matchstick and paper complex of local officers. Policing Guadalcanal, mosquito ridden, heat ridden, bug owned, and underbelly of hell! Ha! It’s a good idea at that but incongruouss as hell. Russell is busy chasing flies which are drinking his beer. Damn flies are committing the unpardonable sin. We ought to begin flying about Monday a.m. Should be at Stirling7 or the Russells8 by next Saturday. Sure. Hope! I Hope! This laying around is hellishly monotonous. P-38s and P-40s had a lot of fun pin wheeling all over the sky this morning. Most of the boys would give their left something or other to fly them. I can’t say as I blame them. There are still no letters from home. This mail service had better get on the ball and I don’t mean perhaps. Well’ it’s time to read a few more pages from the Bible. 10:55 am. One hour and five minutes reading time finds me deep in Numbers. Dinner is over. Ah Yes! Did I tell you, we had fresh eggs this morning? My stomach is very happy. I received some orange juice at the PX this noon. No wonder the army messes in the states didn’t have juice. Hell, it’s all here at Guadalcanal! Ah! Yes! Wrote a very short story today entitled, “Poor Ratsumo” this to be attached to this diary.9 No doubt the story has been true many times in this war! You shall be the judge of that! Well, wonders never cease? The word is now is that there are many brand new Hs at Sterling awaiting B-25H trained personnel. It seems the boys who fly the Cs and Ds do not like them. Put a ring through our noses and lead us to them, brother! We love ’em. We’ll go in at low level and fire that 75 anytime, anyplace. That’s our meat and we were weaned on a strafing, cannon firing, and hell of a good ship. Heavens, what an awful show last night, no plot, no decent acting, no sense, no nothing. Leopard Man is supposed to entertain us tonight. It had better be good. Two in a row like the one last night, begins another battle on Guadalcanal. Ha! There are only 14 billion dead dratted flies around “cheer” today. Wish they were all dead, a sacrifice to something or other. Understand during an aerial review at South Carolina that three ships crashed and 19 men were killed.10 Hope the C.O.’s edification of himself was satisfied when that happened! It seems criminal out here to have that happen. We have very few accidental crashes out here to have that happen. In fact the record here is edifying. Next to Renshaw class and also to Jam Handy trainer11 this afternoon. Two more boring classes, but both will come in damn handy in an enemy filled sky. I take all I can get even though it is not likeable to me. Three Guadalcanal mosquitoes made a mistake and landed on Koli Field yesterday. The ground crew jumped on them and filled all three with 100 octane gas before discovering their mistake. Of course officer wanted to know the cause of the shortage of gasoline, a little while later. All the ground crew could do was stand there and gulp. Probably didn’t think the ground officer would believe their story! Screwy effect this place has on a person, eh? Suppertime! The Leopard Man12 wasn’t a bad show, but the boys were looking around this jungle and were very free with the displaying of their flashlights. The thought of a black leopard on the loose in the night is, to say the least, blood curdling. Read the 23 Psalms13 before retiring tonight as well as saying my prayers. Goodnight. 1 Tony, the Kawasaki Ki-61 Japanese fighter. See: http://www.youtube.com/watch?v=06W1ANSBteM. 2 Betty, the Mitsubishi G4M Japanese land-based bomber. See: http://en.wikipedia.org/wiki/Mitsubishi_G4M. 3 “.50 calibers” refers to the .50 caliber M2 Machine Gun designed by John Browning. The B-25H, in addition to a 75 mm cannon in its nose, carried eight forward-firing .50 caliber machine guns as well as six other .50 cal. machine guns used to defend the aircraft. As a gunner/armorer, Wayne was responsible for the cleaning and maintenance of the 14 .50 cal. machine guns on his aircraft. For information on John Browning’s ubiquitous machine gun, see: http://en.wikipedia.org/wiki/M2_Browning. 4 During World War II, Chungking (now Chongqing) was the headquarters of Generalissimo Chiang Kai-shek’s government and Allied forces in China. It was heavily bombed by the Japanese. 5 Pitch, a card game. 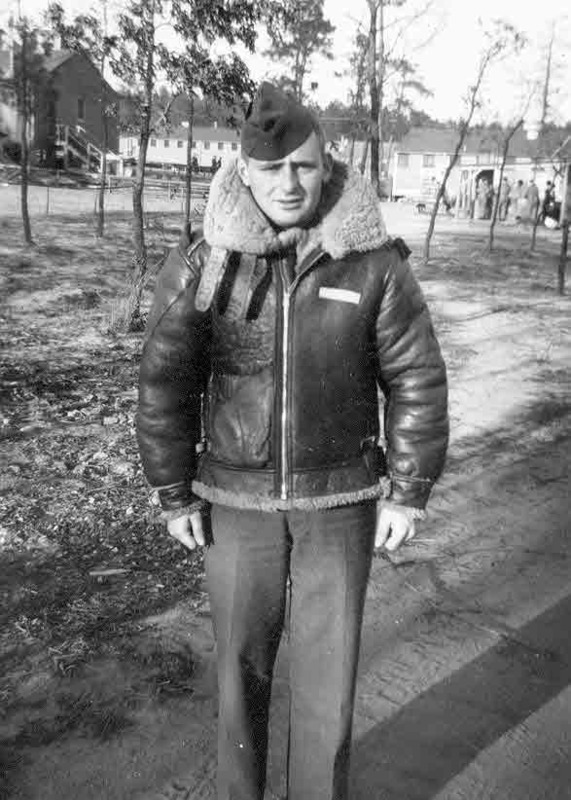 6 Nathan F. Twining (1897-1982), a fighter pilot, commanded the Thirteenth Air Force from January 1943 until January 1944 when command was passed to Hubert R. Harmon (1892-1957). Harmon was the first superintendent of the U.S. Air Force Academy. See: http://en.wikipedia.org/wiki/Nathan_Farragut_Twining and http://en.wikipedia.org/wiki/Hubert_R._Harmon. 7 Stirling Island is located among the Treasury Islands. See: http://en.wikipedia.org/wiki/Stirling_Island. 8 Russell Islands located in the Solomon Islands. See: http://en.wikipedia.org/wiki/Russell_Islands. 9 “Poor Ratsumo”. Wayne, as noted in his entry for February 20, 1944, had ambitions to be a writer. 10 During low-level formation flying on Saturday, February 12, 1944 at Greenville Army Air Base, the wings of three B-25s collided and the planes crashed. Nineteen Killed in Bomber Crash, Three Planes Collide at Greenville, S.C.
GREENVILLE, S. C., Feb. 12 (UP) Nineteen men were killed early today when three B-25 medium bombers collided during formation flying, the Greenville army air base commander reported tonight. Two of the planes burst into flames while still in the air and the wreckage of all three was strewn over a wide area, but with no damage to the base installations, army officers said. There were no survivors. The planes were part of a formation of 24 bombers arranged in four flights of six each. A board of officers is investigating the cause of the collision. “Nineteen Killed in Bomber Crash, Three Planes Collide at Greenville, S.C.” Augusta (Georgia) Chronicle, 13 February 1944, p. 1, col. 4; digital image, GenealogyBank.com (http://www.GenealogyBank.com : accessed 3 June 2014). 11 The Jim Handy trainer was a “realistic simulator using two synchronized movie projectors and sound effects of real engine noise and machine gun fire. It was portable and easily set up, and cost just $2,000. One projector ran actual combat film footage of fighter approaches, attacks, and breakaways, while the other projector cast a spotlight in the shape of a ring sight showing the correct point of aim. … The gunner sat behind a mock .30 caliber machine gun with an optic sight. When fired, a dot of light projected on the screen showing the student’s point of aim. If the student fired at his target within the correct range and lead, he was rewarded with the sound of real gunfire; otherwise an annoying bell would ring.” “Aerial Gunner Training,” Bomber Legends, p. 15 (http://dc239.4shared.com/doc/WzGvi4z2/preview.html : accessed 15 January 2010). 12 The Leopard Man was released in 1943 by RKO Radio Pictures. It was filmed at Santa Fe, New Mexico and at RKO Studios in Los Angeles. The story of a black leopard “spreading panic throughout a sleepy New Mexico town, it starred Dennis O’Keefe, Margo, and Jean Brooks. See: http://www.imdb.com/title/tt0036104/?ref_=fn_al_tt_1. 13 The LORD is my shepherd; I shall not want. He maketh me to lie down in green pastures: he leadeth me beside the still waters. He restoreth my soul: he leadeth me in the paths of righteousness for his name’s sake. Yea, though I walk through the valley of the shadow of death, I will fear no evil: for thou art with me; thy rod and thy staff they comfort me. Thou preparest a table before me in the presence of mine enemies: thou anointest my head with oil; my cup runneth over. Surely goodness and mercy shall follow me all the days of my life: and I will dwell in the house of the LORD forever. This entry was posted in Uncategorized and tagged B-25H, B-26, bananas, beer, Betty, Bible, Chungking, eggs, flies, Hubert R. Harmon, Jam Handy trainer, Koli Field, mosquitoes, Nathan F. Twining, orange juice, P-38, P-40, pineapple, PX, Rabaul, Renshaw, Robert Earl Russell, South Carolina, Stanley LeVelle Seehorn, Tojo, Tony. Bookmark the permalink. I encourage you to sign up as a “follower”. If you do that, you will receive an email notification each time a new entry is posted. The current entries appear daily. He is on Guadalcanal and in a training mode that consists of a few hours of class each day. He has little to do and writes every day. His will soon be transferred forward to a combat zone. His daily entries will become less frequent and take on the form of summaries of missions and events. Sign up as a follower. You don’t want to miss anything. The crash in South Carolina referred to in the 26 February 1944 entry was probably the midair collision of 3 B-25s at Greenville, SC on 12 February, 1944. Based upon contemporary newspaper accounts, I feel certain he was citing the mid-air collision of three B-25s at the Greenville Army Air Base during low-level formation flying on Saturday, February 12, 1944.